Bravo Airsoft continues to produce high quality internal components, and their latest offerings are upgraded motors, in high speed and high torque models. Today, I will be writing a brief review of their long high speed motor, the Xyclone. I obtained this motor directly from Bravo Airsoft in order to give it a first look review here on Airsoft Retreat. In this review, I will be looking at the construction of the motor, as well as the performance gains that it can give your AEG. It is currently priced at about $70-$80 at most major airsoft retailers. As mentioned before, the motor being reviewed today is a super high speed model, long length, designed for M4/16s, MP5s, etc. This motor has strong magnets, and my sources indicate that it spins at 53000 RPM, making it blazing fast. The only weak point indicated to me, and that I can confirm first hand, is the pinion gear is not the strongest material, so replacing it may be necessary later on. The motor comes packaged in a clear plastic sleeve, with a Bravo label. My first impression on checking out the motor is that it had damn strong magnets, making it quite difficult to rotate by hand. The motor has a chrome metal housing, with a blue plastic bell housing. A Bravo label can be found on the side of the housing, and the pinion gear uses a "D" type rod. As mentioned before, the metal used on the pinion gear isn't the best in the world, so I would look into replacements in case you start to have problems with it. 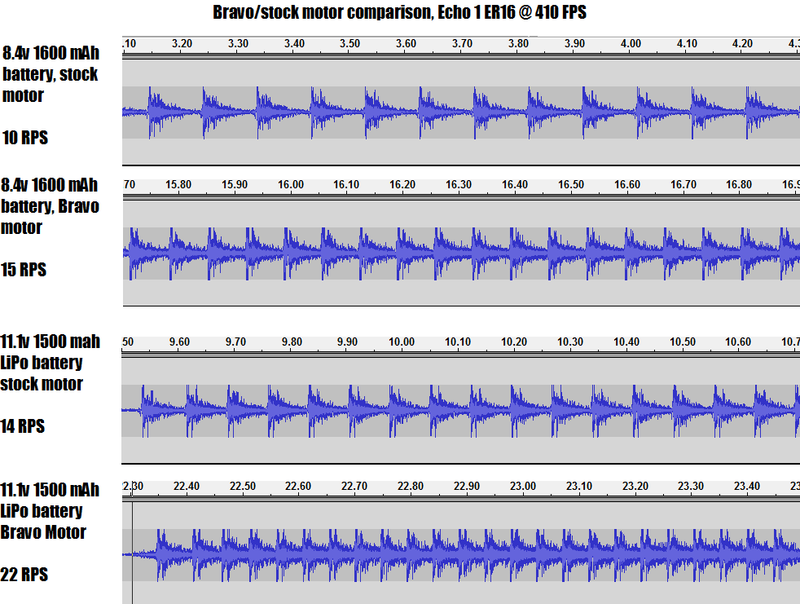 It's a really solid little motor though, and the performance section below will show the ROF gains that it provides. I've prepared a video below to show the performance gains of this motor in a variety of gun models. As you can see, it increases you rate of fire substantially, using a variety of different battery sources. If you want a motor to increase your ROF, this is certainly a great place to look! I did detailed testing using my Echo 1 ER16, firing at about 410 FPS. I took audio recordings using Audacity, using both an 8.4v 1600 mAh Intellect mini battery, as well as an 11.1v 1800 mAh 15C Elegence LiPo battery. This motor helps turn your gun into a BB hose, ready to spray a cloud of BBs at your opponents. It gives you great performance, and the only real shortcoming is the iffy pinion gear, which can easily be replaced. I know that this thing will happily find a home in one of my custom guns! Many thanks again to Bravo Airsoft and of course, Airsoft Retreat!